LG has an extensive 2014 4K Ultra HD line-up featuring seven screen sizes and three model series including the UB9800, UB9500 and UB8500. The UB9800 is their top-of-the-line series, offering three screen sizes at 65″, 79″ and 84″. I have come to enjoy the picture quality of LG’s 4K TV’s, and have personally found them able to produce some of the best 4K HDTV images on the market. The 79UB9800 continues with this trend and is the focus of this review. The 79UB9800 is a very attractive Ultra HD display that commands attention as you walk within its presents, just by the sheer size of its picture screen. You are then drawn into the image like a way-ward space vessel to a black-hole in outer space. The bezel itself is slim with black trim and contrast well with the display’s attached “silver bars” that contain the Harmon Kardon speakers placed on either side of the screen. This premium audio system features a 5.2 driver configuration, with mid/high frequency speakers within the silver bars and two woofers mounted in the TV’s cabinet. Due to the size and the design of the speaker system, the depth of this TV is 3-5/8″, which is much deeper than your typical flat panel display. The stand on this TV is an arching design that runs the entire length of the screen and adds to its already attractive design. I personally like this type of stand because it adds stability to the set and will reduce the chance of accidental TV tip-over. LG’s IPS (In Plane Switching) panel provides for wide off-axis viewing angles. I will talk more on this in the performance section below. LG’s Tru-4K Engine Pro enhances the displays resolution and provides excellent up-scaling of standard definition and high definition (1080p) video sources to near 4K quality. The 79UB9800 is HDMI 2.0 compliant for increased bandwidth and higher resolutions, and allows for frame rates up to 60fps. HEVC/H.265 compression is also on board for streaming 4K video from services like Netflix. The WebOS smart TV platform is very intuitive and simple to use and assist in setup of the TV. You also have access to all of your favorite apps which can be customized to suit your needs. The UB9800 is 3D ready and is supplied with two pairs of passive technology glasses. The set contains a top mounted retractable camera for two way video communication such as Skype. Built-in Wi-Fi is also available for connecting to your homes wireless network. 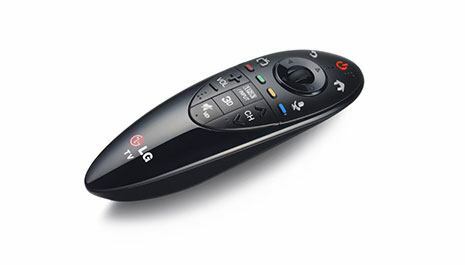 LG’s compact Magic Remote features two key functions: 1) Voice Mate is a speech recognition feature that allows you to access certain TV functions such as volume control, channel changing and accessing your app content all by the natural sound of your voice. 2) It also has point and click capability that allows you to use the remote as a pointer to control the TV display by movement of a small icon on the screen. I actually liked this feature and felt it was a cool alternative to operate the TV. This feature however, took some getting used to with its functionality…I felt the on-screen cursor was very sensitive to movement as tried to access the displays icons. Also, I felt the buttons on the remote were not that intuitive as far as user friendliness goes. However, this was only a concern as I initially began to use the remote. Once I got past its short learning curve, all was well. For picture evaluation I viewed scenes from the movie Fast &Furious 6 (blu-ray disc). The sets video processing upscaled the images to 4K. Viewing outdoor daylight scenes really showcased this Ultra HDTV’s awesome picture reproduction capability. Images on the screen had a very three dimensional quality about them. Objects within the picture landscape, especially people, really stood out from background images. There was a tremendous amount of image depth and clarity. Fine detail was also excellent. Color rendition was very vibrant and well saturated with very good contrast which made the colors pop from the screen. Scenes from this film, along with some native 4K LG demo footage I viewed on this set were some of the best images I have seen to date. Even with all the beautiful image reproduction mentioned above, the 79UB9800 did have some performance issues that concerned me… first, I want talk about the backlight bleeding I saw on this display. The 79UB9800 uses edge lit backlighting where the LEDs run along the edges of the screen. The light is then directed outward to the display panel. However, with display screens of this size and larger, the backlighting designs can become more difficult to implement by manufacturers, thus problems can arise in the form of backlight bleed. On the UB9800 I noticed signs of this anomaly on a completely black screen with the light bleed showing itself in all four corners of the display’s panel. Oddly enough I could only see this when I viewed the TV at very wide angles. Second… black levels although good on this set, were not as dark as I would have liked to have seen. For example, during the night time scenes I viewed that contained lots of bright lights from buildings, street lights and vehicle head lights, the night time sky was not a deep black; it had some very slight grayish overtones. However, it wasn’t enough to be distracting. I expected better LED black level performance, especially on a HDTV of this caliber. And I have seen better black level performance even on lesser LED TVs. However, I must point out that IPS panel technology, although excellent at producing extremely rich and vibrant colors, very fine detail and clarity, and having very good wide angle viewing performance, are also known for their inability to produce deep (inky) black levels. Off-axis viewing is one of this TV’s strong points. I was able to move to the most extreme viewing angles and witnessed only very slight picture dimming. Very good performance, especially for and LED TV. Sound quality from the Harmon Kardon audio system was very good. The speakers produced a very nice and focused stereo image when standing front and center with the display panel. The system was able to play very loud and maintained good clarity. 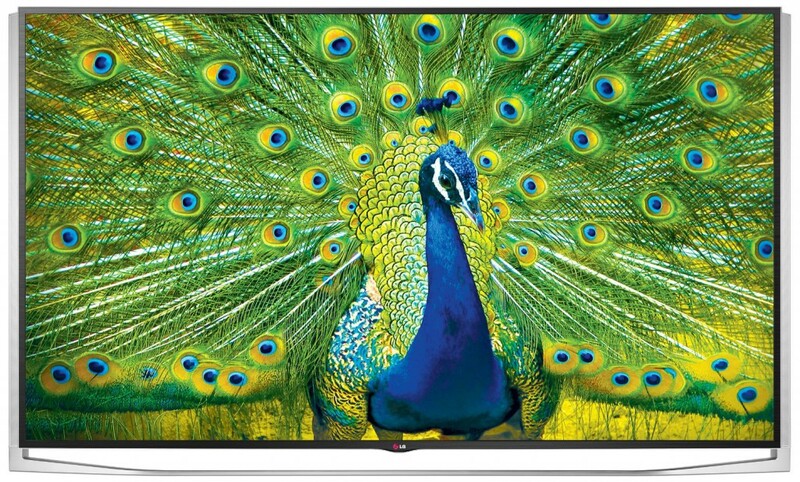 LG’s 79UB9800 is a very fine performer in most key areas with the exception of the backlight bleed issue and less than stellar black level performance for a premium 4K LED Ultra HD display. This set does make up for its short comings with its outstanding 4K and 1080p image reproduction in the key performance areas I mentioned above along with its striking good looks. So if you’re in the market for a mega screen 4K HD display and a high price tag isn’t an issue for you. I recommend you head out to your local electronics store and have a look at the 79UB9800 and see if its right for you. • Weight without stand: 125 lbs. • Weight with stand: 132 lbs. Have any comments or feedback about this review? Please leave them below.